Normal darkening had occurred after patient had a root canal done on one of her front teeth. By performing a treatment called "internal bleaching" on just the darkened tooth both teeth are of similar shade. Two left front teeth in photos became dark after dental trauma. 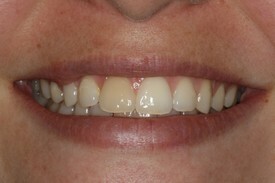 Patient wanted to improve the shade appearance of teeth with a conservative approach. 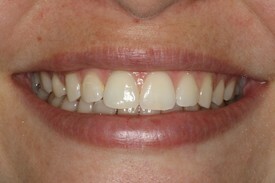 Internal whitening was successfully performed to avoid the need of veneers and/or crowns.